My infant son has been a really big fan of a particular toy we received as a gift. 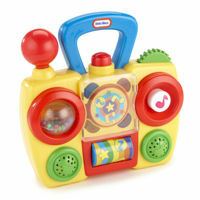 The Pop Tunes Boom Box, by Little Tikes, has been the one single toy that has held his interest for many months, and still continues to provide surprising stretches of entertainment. This is a plastic boombox that plays 4 melodies when a certain button is pressed. There is a spinning disk, which my son seems absolutely fascinated with, along with a button that makes several sounds, a spinning plastic ball which contains many tiny balls, and a few other parts that move and make noise. This toy has been able to calm him when he’s crying, keep his interest during the “witching hours” in the evenings, and has been of interest for discovery and exploration for him longer than any of his other toys. He liked hearing the music and watching the lights early on (about 3 months) and now that he is almost 9 months, he enjoys manipulating the different buttons and sounds in addition to the audio and visual stimuli. I would highly recommend this one for the young and the curious. P.S. A friend of mine said she has this same toy in blue and the music is too loud, she checked out ours (yellow), and said it sounded much nicer. When out shopping with a baby in a stroller, one can fit only so much in the stroller basket. I find The Mommy Hook to be a simple and yet absolutely necessary item. I have two on my son’s stroller. 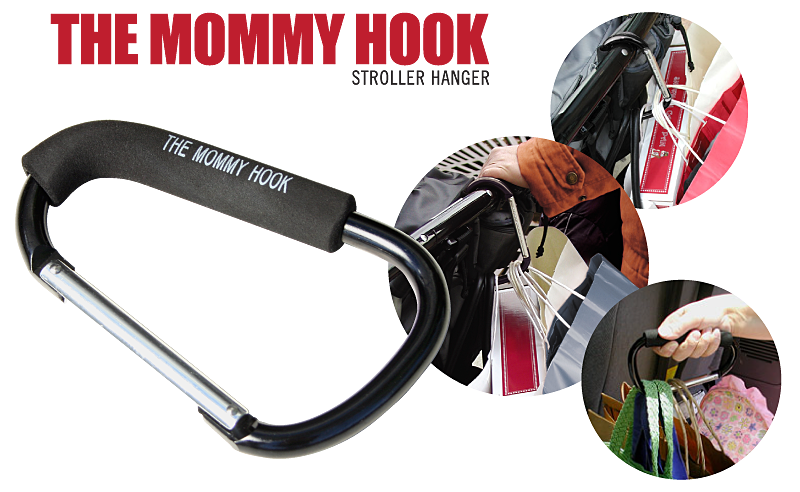 It’s a large metal carabiner which attaches to the stroller handle and is a great place to hang shopping bags, an umbrella, or whatever else you may need to bring along. There are plastic variations on the market, but this seems to be the sturdiest. 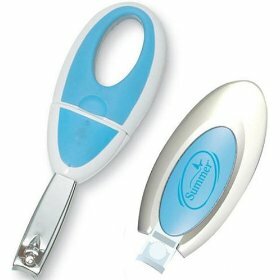 This item is definitely at the top of my list of mommy products. The Citigroup Building at 153 East 53rd St (Lexington Ave) has a large toy-train show exhibit every year, apparently this is going to be the last year. Here is an article about it. There is an “enchanted forest” set up on the eighth floor, with talking trees, dancing bears, skiing penguins, toy trains, Christmas trees and more.Through 12/24. Mon.–Fri., 9 a.m. to 9 p.m., weekend times vary. 151 W. 34th St. at Sixth Ave., eighth fl. (212-494-4495). Macy’s also has a very cool window display on Broadway, full of lights and things that move, which seems to be a hit with the little ones. resources. Through January 11, 2009. At his 6 month appointment, my son’s pediatrician said that he should start drinking water with a goal of 4-6 ounces a day. 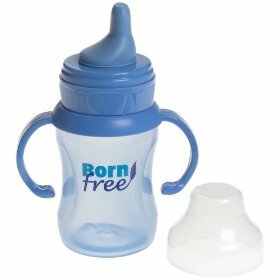 I started him with a Born Free Trainer Cup and he has been taking in about 0.5-1 ounce/day. The flow seemed to be quite strong, and my son began to choke after a couple of sips. At 7 months, although he tries, he is not able to drink independently. Because the spout fills up with water and my son tends to bite down on it, he ends up pretty wet all over if I let him play with the cup. I decided to try a different cup with a soft spout. 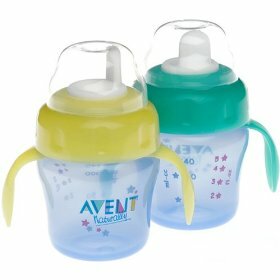 I chose the Avent Magic Trainer cup, and it seems to work much better for my son. He is able to drink without choking and is actually taking in 3-4 ounces per day. Because the spout is less voluminous, biting down on it does not cause a much of a leak, so that I can let him practice drinking independently without having to change his outfit. I have been having a harder time clipping my son’s nails. I used to do it while nursing, but now that he is seven months old, he is too easily distracted and my trick has stopped working. Some of my friends do this while their babies are asleep but I’m too nervous to wake him up. Well…. I have discovered a new trick. I turn the TV on for a few minutes and he seems hypnotized. I can clip all his nails and as soon as we’re done, the TV goes off. This may work so well because I never really turn the TV on when my son is in the room and thus it is a new stimulus, but whatever the reason, it works!